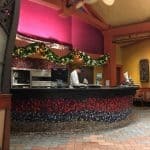 When planning my vacations to Walt Disney World I don’t normally make many breakfast reservations. I don’t like to feel too rushed in the mornings, and I always try to make “rope drop” arriving before park opening to maximize my touring time. But, I also like to have days that I take a break from the parks and enjoy all of the other amenities that Disney has to offer . 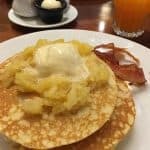 . . including delicious breakfast options. 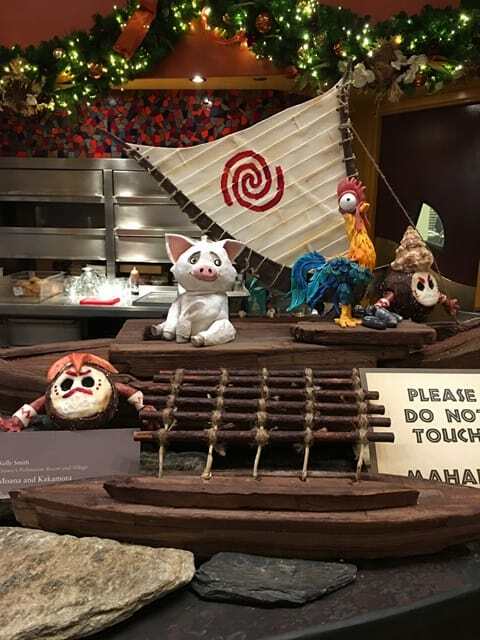 On this trip it was a combination of these two philosophies that found me at the Polynesian Resort’s Kona Café for a 7:30am breakfast with my traveling companions. 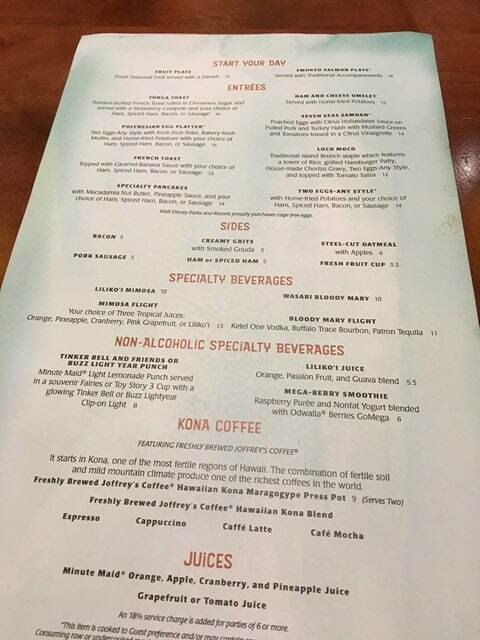 Kona Café has long been one of my favorite breakfast locations at Walt Disney World. If you are planning a day at the Magic Kingdom, the location is perfect. 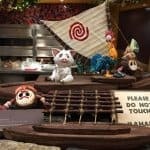 Kona offers an a la carte menu, so it is often a more affordable option compared to many of the character buffet options. And the menu is out of this world! If you have a car you can drive to the Polynesian Village resort and let the gate know you have a reservation. Otherwise you could choose to take a Minnie Van (if you have access), Uber or Lyft, or you can use Disney’s transportation taking a bus to the Magic Kingdom then a monorail or the resort boat launch over to the Polynesian. 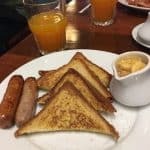 If you have a very early morning breakfast you’ll need to be mindful of the operating times for Disney transportation. 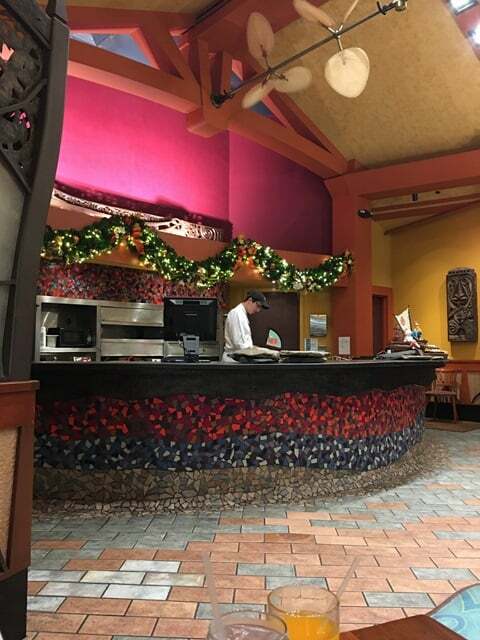 Once at the Polynesian Kona Café is on the second floor of the Great Ceremonial House, beside ‘Ohana. 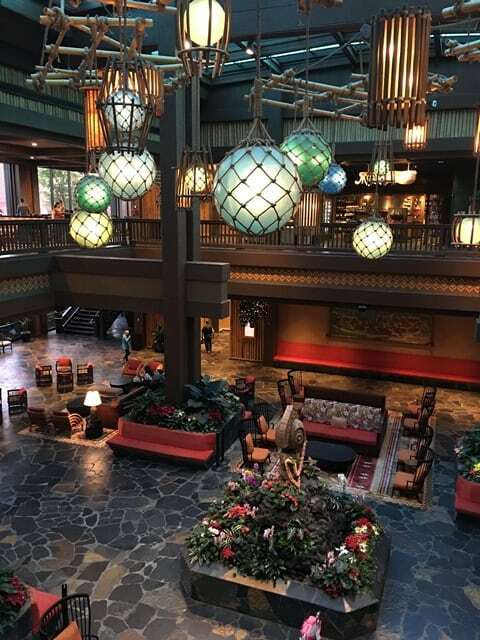 The atmosphere here can be loud as it is open to the two story lobby, the guests going to and coming from the monorail, those waiting on ‘Ohana or visiting the lounge. The décor is South Seas influenced with earthy wood tones, it is comfortable yet classy and understated. While you definitely see the tropical vibe and Polynesian feel it is not over the top at all, even a little bit modern in design. We actually had 2 reservations for 2 people each, but asked to be seated together. As the restaurant was mostly empty they had no problem accommodating us, but that may not always be an option. I always find it funny when there is no one seated and they have people waiting with pagers for their table. I think at this time of the morning it is more of a way of spacing out the tables for servers. Speaking of service, ours was sufficient and efficient. Not really anything to write home about as far as excellent, but for this morning when we were trying to get to the Magic Kingdom and not miss too much of the optimal morning touring it was just what we needed. Efficient order taking, delivery and making sure we had what we needed. To start most of our party chose the Liliko’s Juice, aka POG (Passion Fruit, Orange, Guava) to drink, you really can’t go to the Polynesian and not choose this selection. 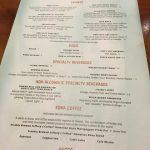 One menu option I noticed was to order a POG Mimosa or a flight of Mimosas with various juices. While none of us partook of the Mimosas, this looked like an excellent choice. 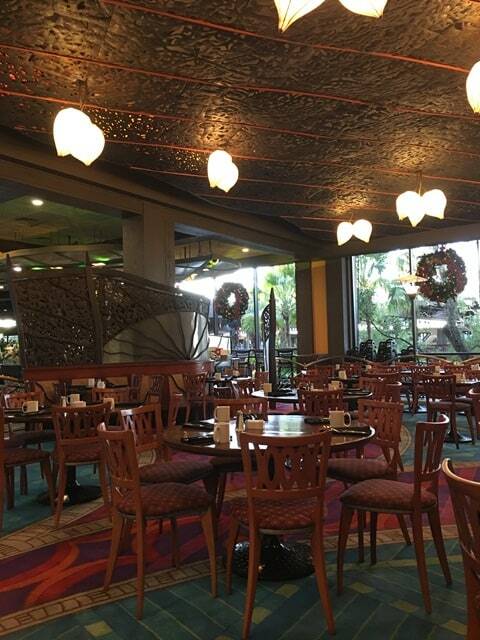 Most of Kona’s breakfast entrees are inspired by the South Pacific and the Polynesian Village Resort’s theming. 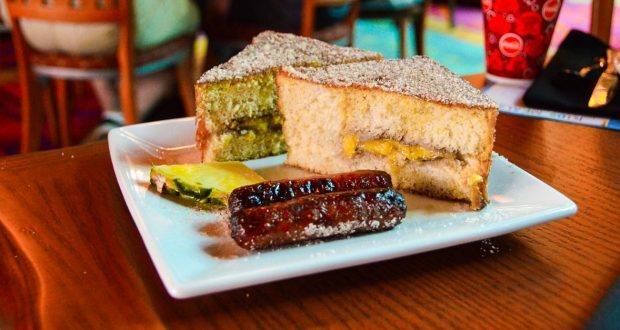 One of my favorite menu choices is the Tonga Toast, a humongous banana stuffed French toast that is coated in sugar & cinnamon and served with a strawberry sauce. While it is absolutely delicious, it is also absolutely rich and filling and with our next stop being the Magic Kingdom to use FastPasses on roller coasters I decided it might not be the best idea on this morning. 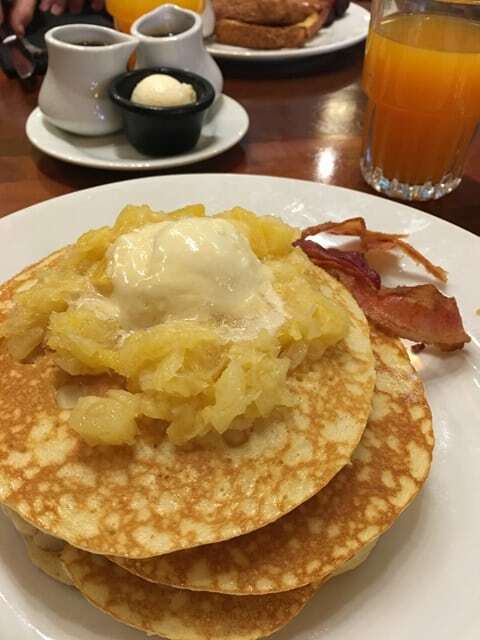 Instead I chose the Specialty Pancakes which are served with Macadamia Nut Butter and Pineapple topping. I’m not sure they are any less filling, but they felt a little lighter and were equally delicious. 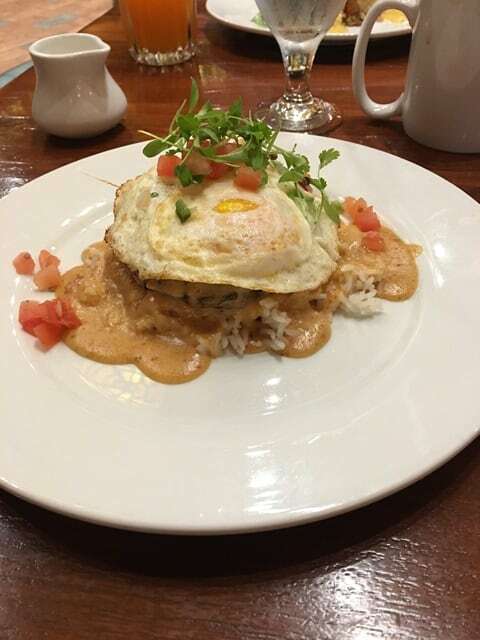 Around the table my friends had the “Loco Moco” which is a traditional island brunch staple which features a tower of rice, a grilled hamburger patty, house-made chorizo gravy, two eggs-any style, and topped with a tomato salsa. 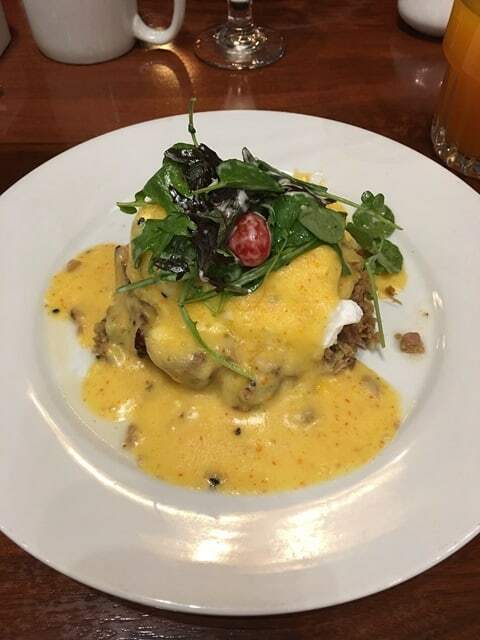 Another had the Seven Seas Samoan, consisting of Poached Eggs with Citrus Hollandaise Sauce on Pulled Pork and Turkey Hash with Mustard Greens and Tomatoes tossed in a Citrus Vinaigrette. 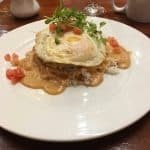 Way too much for me personally for breakfast, but they both declared the dishes delicious with a great combination of flavors. They even said it was one of the best things they ate on their vacation (this was their last morning of magic). 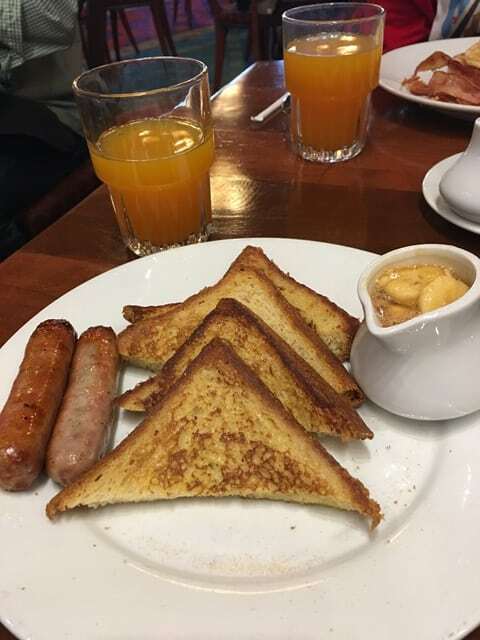 Our fourth companion when with a lighter option by ordering the French Toast which was made more special with the caramel banana sauce (think similar to the sauce served with ‘Ohana’s bread pudding). Yummmmm. Now, let’s talk price. 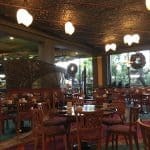 We all know that dining at Walt Disney World is more expensive than most of our hometowns, sometimes it is even an investment (or a shock). But I am happy to say that I believe Kona is a very good value. 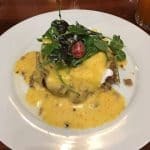 With entrees currently ranging from $12-$16 (as of January 2018), you get a healthy portion made with fresh ingredients and well prepared, not to mention the creativity of the menu. That is why Kona Café has me coming back over and over. 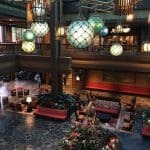 Also, be sure to ask if there is a discount available, some groups like Annual Passholders or Disney Vacation Club Members could be eligible for a discount at certain times of year. 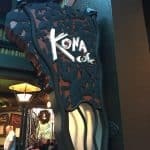 Overall I highly recommend breakfast (or brunch) at Kona Café if you are looking for a resort breakfast experience with delicious food, a great location (if you are also visiting a theme park), and a nice value for an on-property restaurant. 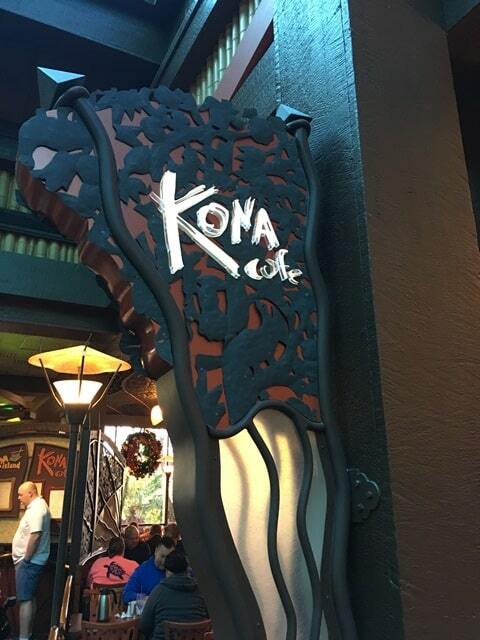 Do you love Kona Café for breakfast as much as I do? What is your favorite dish?